Are we ready to prevent the next food price crisis? When prices of staple food crops soared in international markets in 2007-10, it was a wakeup call for many world leaders to take action. In view of millions of families being pushed into hunger, the G20 decided to create the Agricultural Market Information System (AMIS) to combat excessive volatility by enhancing transparency and policy co-ordination in international food markets. Since its launch in 2011, AMIS has provided more reliable and timely assessments of global food supplies by working closely with the main trading countries of staple food crops. This has created a more level playing field for all market actors to make informed decisions. Even more important have been achievements in the area of policy dialogue. When maize prices spiked in 2012, for example, regular exchanges among the key producing countries helped avoid a repeat of hasty policy action, such as export bans that had exacerbated market turbulences in the past. Through AMIS, it seems, the world is better prepared to minimise the risk of future food price crises. 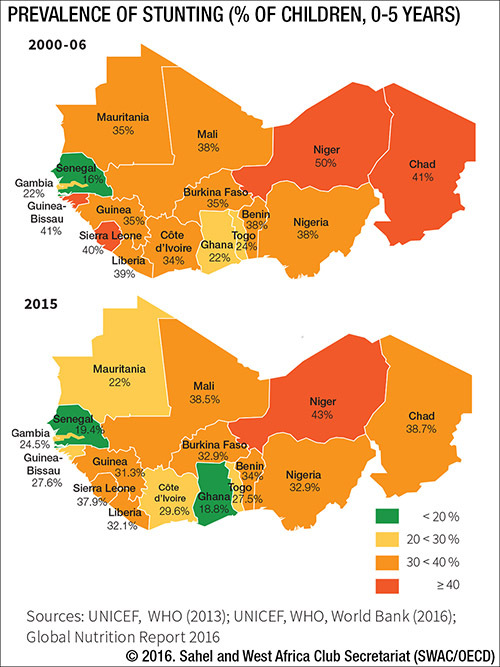 The Sahel and West Africa region is home to some of the most nutritionally insecure people in the world. In 2015, 19 to 21 million children in the region under the age of five were affected by stunting. This figure is growing and may exceed 22 million by 2025. Today, strong evidence exists linking social protection to improved nutrition. In December 2016, the 32nd Annual RPCA Meeting focused political attention on some of the key challenges to be overcome in this area. By John Staatz, Professor Emeritus in the Department of Agricultural, Food and Resource Economics at Michigan State University, and Frank Hollinger, Economist at the Investment Centre Division (TCIA) of the Food and Agriculture Organization of the United Nations (FAO). Burkina Faso is a poor, land-locked West African country, with about 18.5 million people, a number that is increasing fast at 3.1% per year. Categorised as a Least Developed Country (LDC), Burkina Faso regularly ranks at the bottom end of the Human Development Index (183 in 2015). Poverty is mostly rural (50.7% rural poor compared with 19.9% urban poor). Food insecurity and malnutrition remain a chronic concern (Global Acute Malnutrition = 8.6%).